HOUSTON – A 24,000-sf sky park—located at 811 Rusk St., bound by Capitol, Milam, and Travis streets—will be part of downtown's Capitol Tower when it opens in 2019. 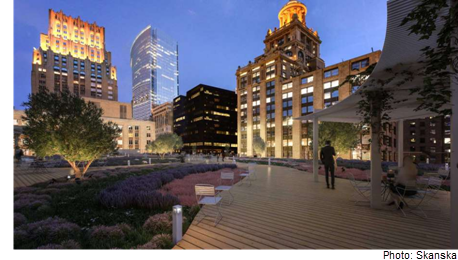 The green roof—located 12 floors above street level—is part of a plan to retain all rainwater on site and help cool the environment. A 50,000-gallon cistern will irrigate the garden with collected rainwater using an automated system. The 35-story Capitol Tower with Bank of America as the lead tenant will use the green roof as a sustainability feature. Read more ​Houston Office Market Research.